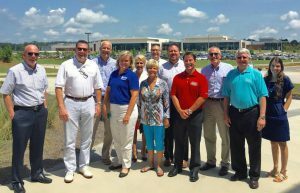 A delegation of twelve community leaders from Johnston County traveled to Covington, Georgia recently to learn about the impact that major economic development projects have on local communities. Novo Nordisk has just started construction of a $1.8 billion insulin-production facility across Powhatan Road from its current plant. Grifols is adding a $250 million addition to its US 70 campus. Thousands of construction workers will be in the area over the next several years prior to the addition of several hundred new permanent jobs. “With over 3,000 employees relocating to our area during the four year construction period, it is important that our County and Municipalities adequately plan for its economic impact. During the peak of construction, the two nearby sites will have the same population as the Town of Benson” said Johnston County’s Economic Developer Chris Johnson, who organized the trip. Other participants on the July 11-12 trip included: Local Developers Kevin Dougherty and Mark McDonnell, Smithfield Mayor Andy Moore, Benson Town Manager Matt Zapp, Wilson’s Mills Town Administrator Zach Ollis, Johnston Community College Dean of Economic and Workforce Development Joy Callahan, and Commercial Realtor Teresa Daughtry.